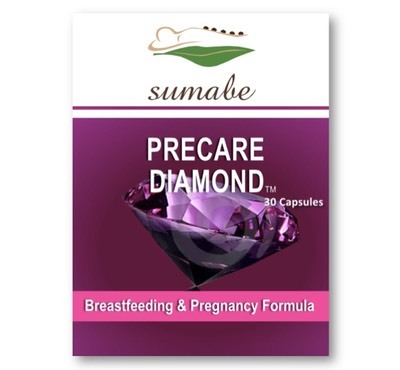 Sumabe® Precare Diamond helps meet the body's increased nutritional demands prior to and during pregnancy, as well as after the birth and during breastfeeding. Precare Diamond contains many of the essential nutrients required for a healthy baby, including DHA and folic acid at the levels recommended by nutritional experts. Precare Diamond includes ingredients such as Folic Acid which is essential for maternal health and foetal child development, folic acid has shown to reduce the risk of neural tube defects and foetal spina bifida. Precare Diamond is recommended to be taken prior to, during and after pregnancy including whilst nursing. Adults, take 1 capsule daily with or after meals, or as directed by your healthcare professional.